The waste processing unit is located in the Charmshar of Varamin city with the latitude and longitude GPS coordinates of 35°06'34.0"N 51°33'57.4"E.
In the Charmshahr, there are about 300 leather factories, which fabricate all types of leather, including ashberta, natural leather, salombo, as well as sheep, cow, goat leathers. In general, wastewater treatment units in the waste processing section are divided into three parts: physical, physico-chemical and biological removal. The entrance to the refinery is 13,000 m3/day. 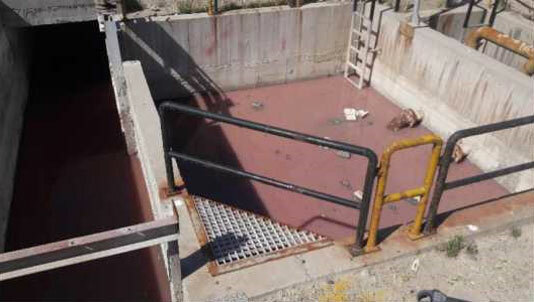 The discharge sludge from the treatment units are 500-700 m3/day. 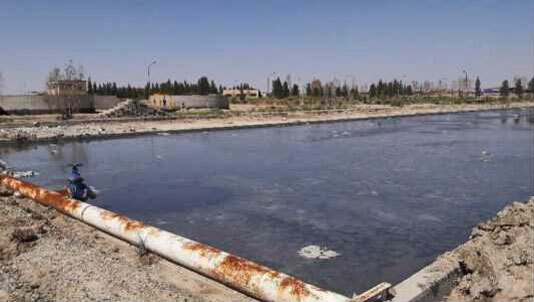 The wet sludge dried in the sludge drying bed (Figure 1) is currently stored on the land bed. There are 10 beds with the dimensions of 20 m width, 100 m length and 1.5 m height (Figure 2). Also, the dry sludge is currently stored in the vicinity of the processing plant. 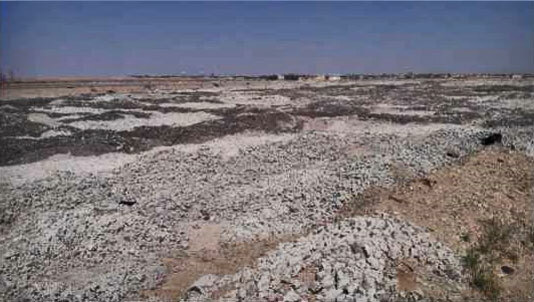 There are about 41250 m2 land area allocated to the storage of dry sludge. The appearance of the treated water in the waste processing unit is illustrated in the Figure 3. This treated water has released into the surrounding area. The elemental analysis of the wastewater after treatment (Figure 3) are listed in the Table 1. Other physicochemical parameters of the treated water are listed in Table 2. The elemental analysis and the physicochemical parameters of the wet sludge are listed in the Table 3 and 4, respectively. As the environmental conditions around the waste processing plant is severely at risk, It is urgently required to implement projects that would prevent further detoriation of the surrounding environment. The first problem is that the treated water with high electrical conductivity is released to the surrounding and it causes the dryness of the land and it reduces quality and fertility of the land considerably. Therefore, additional water treatment should be done to improve the water quality in order to reuse it in the leather factory or to use it in the irrigation system. The second problem is related to the wet sludge. As mentioned above, so far, there is no treatment approach for sludge remediation. The wet sludge dried and then it is stored. But, as it contains toxic and hazardous substances (see Table 3) with disgusting smell, keeping it in an open area (see Figure 2) caused the pollution of the air and groundwater. It is required to utilize the sludge for the generation of the biofuels or other by products. Therefore, a cooperation with specialized companies for solving the problems of waste utilization and management associated with Chamshahr waste processing plant is sought.